There was a gentlemen who posted on this forum if anyone had received the new WBB 70 Ton Switchers, from what some of the answers were and what I have been able to find out on the Williams web site they only have the SP coming out. Can anybody tell me where I can reserve 2 of the SP units? I'm confused as to actually what they're selling. It appears these would be 2-rail models as they're claiming DCC. Of course, in the heading, they claim True Blast Plus, so who knows what they're actually selling! Looks like they caught "cut-'n-pasteitis" from the boys at the Circle L Ranch. That's the description for the HO 70 tonner. Who has 18" radius in 3 (or 2) rail O? Don, GunrunnerJohn and Rusty, thanks so much for your posts, now that you mention it, Train World did have the HO Scale version available not to long ago because I picked one up. I think Rusty is right on the money, I went back this evening and looked at the Williams site and it appears to show the SP 70 Ton unit but it is the HO picture. I'm really hoping that they are planning on coming out with one in O to go with their very nice 44 Tonners. If I knew where to send them an e-mail I'd do just that and suggest that they consider coming out with them. Thanks again guys, looks I've got my hopes up for nothing. The models are O Gauge, not HO. Mario’s Trains will also have them. They are about a year behind on the delivery date. Originally announced for Mar 2018, they are now supposed to be March or April of this year. I eagerly await mine - which will go straight to a custom painter. Sorry about that. Sometimes when you edit add change 30k products you tend to miss a couple. I updated the details this morning. Those numbers are indeed O scale. 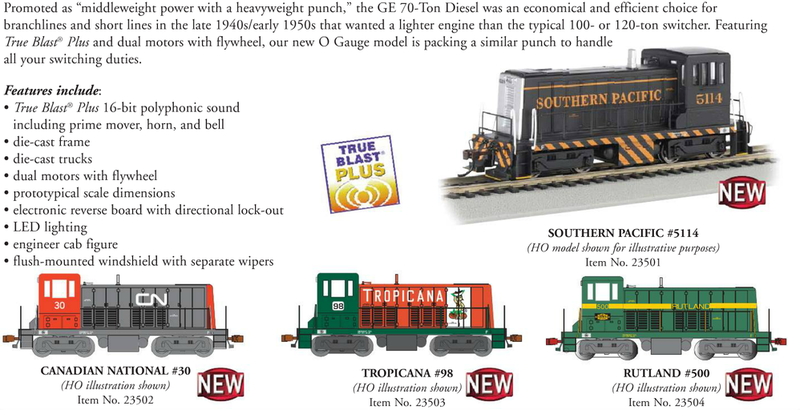 We probably copied the ho product because bachmann does not have images yet and messed up on the description. Thanks for bringing it to our attention. Here is also a picture from the Williams flyer. Not sure on delivery date on these yet. They keep on pushing the date. Ill try to get a better figure from williams. These are now expected in July 2019 as per Williams. Well, alot. Lionel Fastrack is standard curve with 18in radius... that doesnt mean its HO. Ken at Train World already clarified the situation. Please read above and click through the link. They are rated for O-27. Ok... i didnt read link. Just commented that rating of o36 is not smaller than o.